The effort was part of Colby Cares Day and South End Clean Up, both community service efforts intended to improve quality of life in the South End. WATERVILLE — After a long winter, Sharon Latulippe, a resident of Grove Court, looked out her window at the melting snow and a pile of branches left over from numerous winter storms. On one of the first warm days of the year, she wanted to get rid of them but was at a loss to know where to go. Since her husband died three years ago, Latulippe, who works two jobs and walks to work because she doesn’t have a car, said she had nowhere to take the three bags filled with sticks filled from the yard. So she called the South End Neighborhood Association, which helped her remove the debris Saturday morning as part of its annual South End Clean Up. “I’m so glad they do this. There’s no way I’d be able to get rid of it on my own,” said Latulippe, 57, as she stood in her driveway in front of a clean yard. 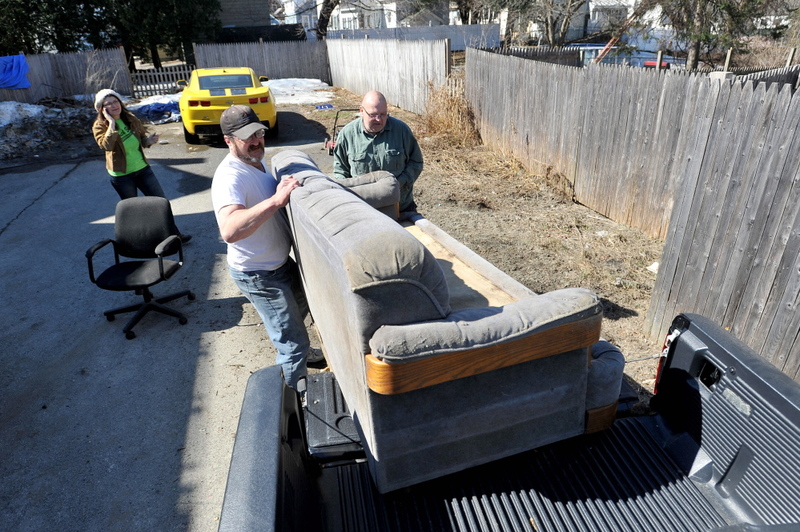 The annual cleanup day, which started in 2001, helps dozens of residents with their spring cleaning by offering removal of items that are too large to be picked up by the regular trash disposal, as well as picking up trash from city streets and parks in Waterville’s South End neighborhood. The neighborhood association organizes the event and recruits students from Colby College to participate as part of their Colby Cares Day, an annual day of community service that also was taking place Saturday. For the past several years, the Colby football team has helped with the South End Clean Up, said Jackie Dupont, co-director of the South End Neighborhood Association. “The intention is to help our neighbors with spring cleaning and to feel good about where they live,” Dupont said. The South End, which is home to the former C.F. Hathaway Co. shirt factory, was once at the heart of the city’s economic pulse; but since the de-industrialization of the area, its infrastructure has declined. In 2001, the neighborhood met to discuss ways to minimize blight and improve the quality of life, and the annual cleanup day was born. Heather Merrow, who is also a co-director of the South End Neighborhood Association, said it has made a difference and volunteers today are picking up less trash than they were 13 years ago. A lot of residents don’t have cars, so getting rid of large amounts of waste or old furniture can be a challenge, she said. “We want our neighborhood to look nice. There’s not a lot we can do about people’s homes and the way they live or what businesses look like, but by doing this we can make a difference in how the neighborhood looks overall,” said Merrow, who was driving a truck with her husband, Ralph, on the way to pick up trash. 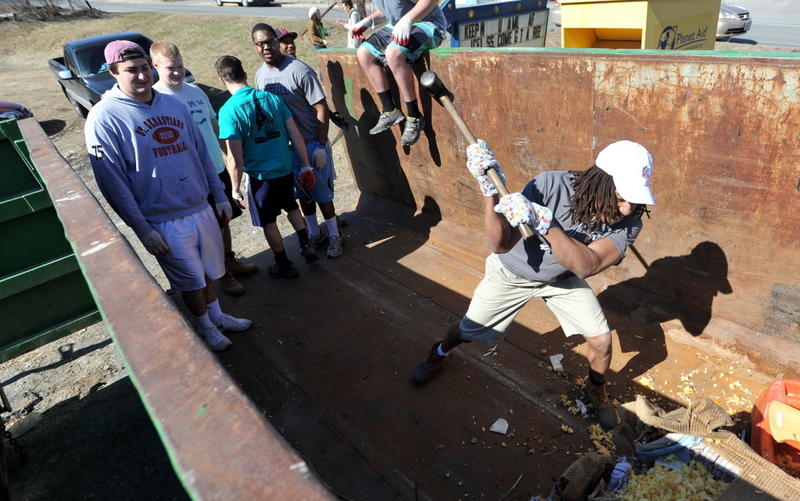 About 20 players from the Colby football team also participated in the cleanup. “It really helps us on and off the football field. I think it brings us closer as a team,” said junior Louw Scheepers, a kicker. His teammate Randy Person, a junior cornerback, attacked an old sofa with a hammer, doing his best to pull the furniture apart and throw it into a dumpster.